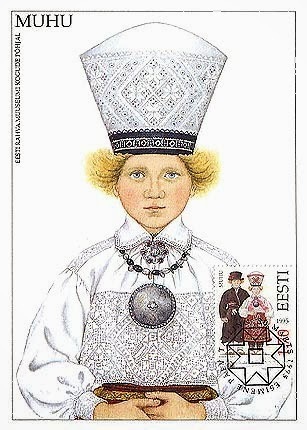 Today I am returning to Estonia, which I feel that I have neglected. I will talk about the costume and a bit about the wide range of handiwork which is native to Muhumaa, Muhu Island. Estonia is divided into 15 counties in four regions; Lõuna-Eesti or South Estonia, Põhja-Eesti or North Estonia, Lääne-Eesti or West Estonia, and Saared, the Islands. 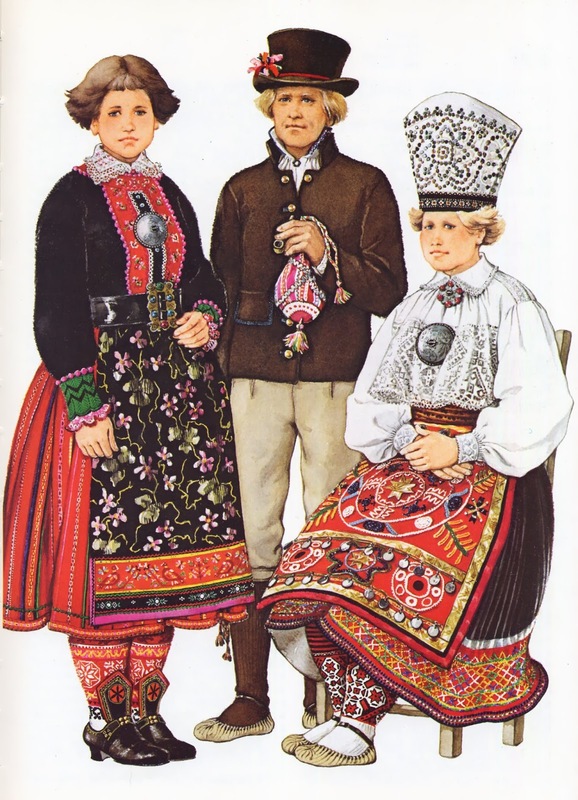 Estonian is a Uralic language related to Finnish, and unrelated to the Baltic languages which are spoken in the neighboring countries of Latvia and Lithuania. 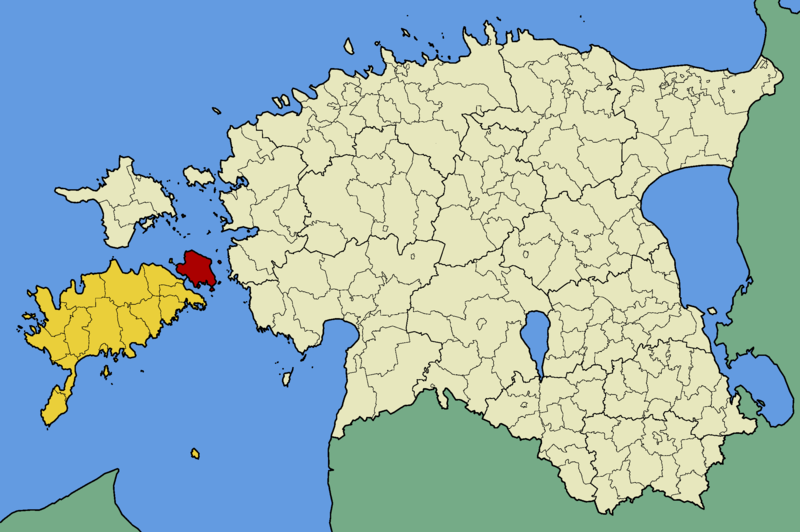 Muhumaa is the third largest island in Estonia, located between Saaremaa and the coast. It is shown in red on this map. The capitol of Estonia is Talinn, and this is their flag. 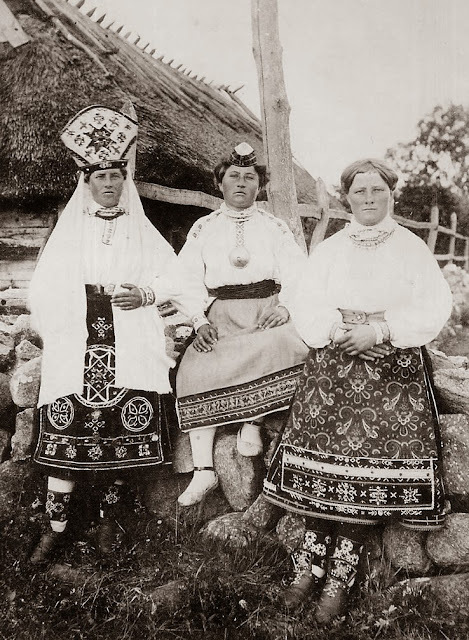 Muhu island is one of the areas of Estonia in which folk costume and native crafts survived the longest. 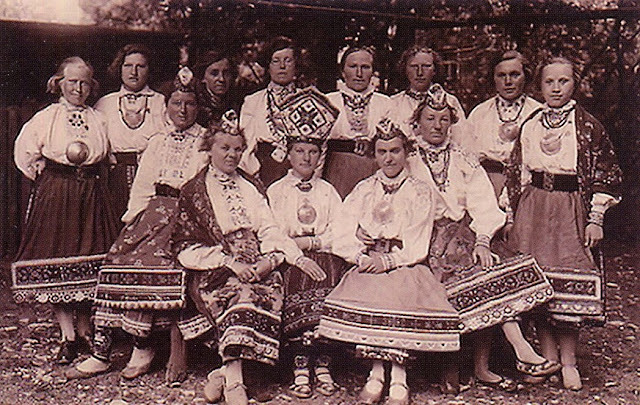 The local costume was commonly worn well into the 20th cent. and native handicrafts are still very much alive. 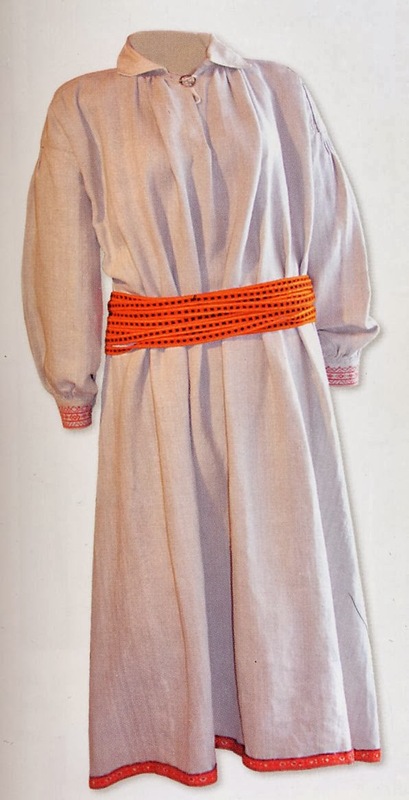 The oldest known costume consists of a chemise and sash. 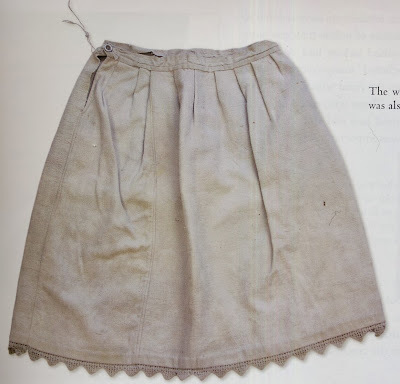 This was worn for work in the fields, especially for cutting hay and harvesting, in which situation more clothing would just have been a hindrance. There also seems to be a ceremonial significance to this costume. Similar costumes were worn in northwest Russia for haying, which had extensive embroidery above the hems, in areas that would not be seen if any outer garments were worn. This chemise has narrow shoulder pieces with embroidery, embroidered cuffs and collar and a card-woven band sewn onto the hem. 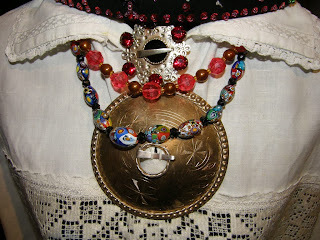 There is also a silver ring brooch holding the neck opening closed. This image also shows one peculiarity of Muhu costume. 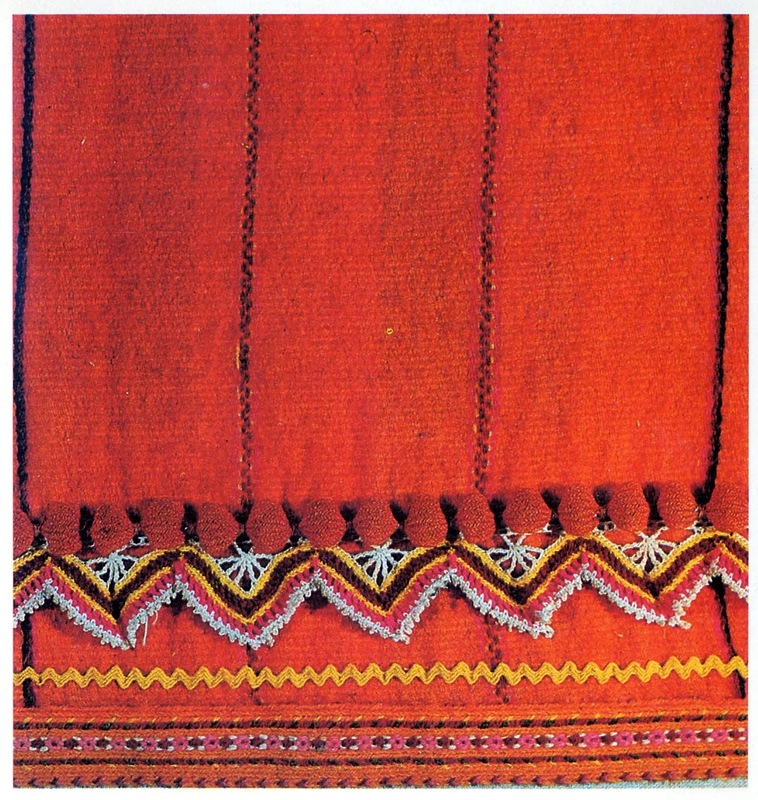 The sash is also card-woven. 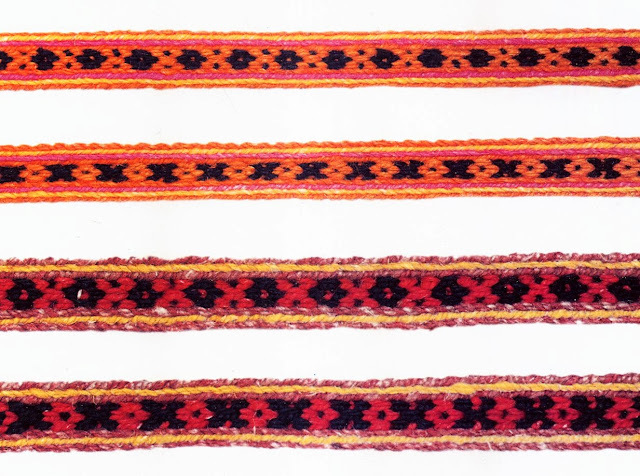 With card weaving, it is difficult to make the product very wide. 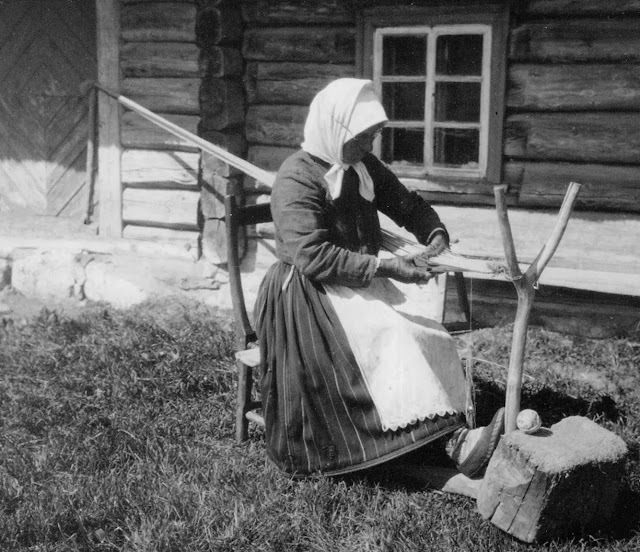 On Muhu the sash was usually about 1.5 cm wide and very long. In most places sashes for folk costumes are long enough to go around the waist two or three times and then tie or be secured. If you look at the image above, you will see that the Muhu sash encircles the waist many more times. 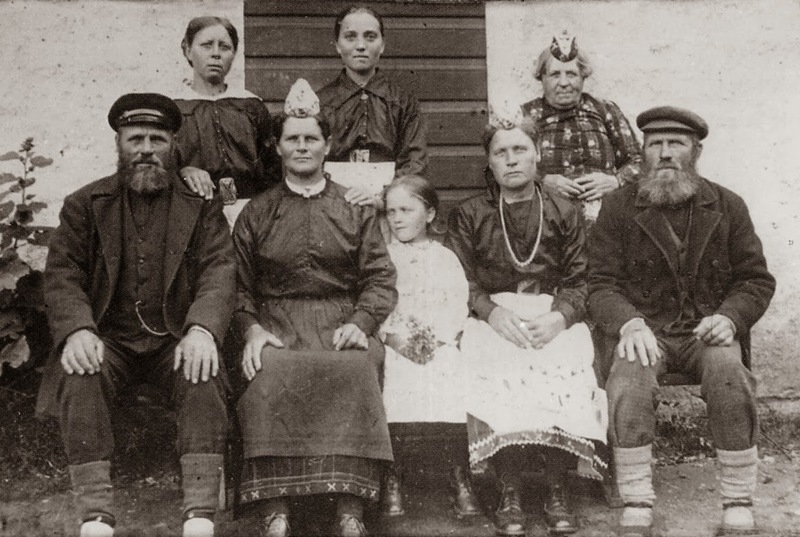 Muhu sashes were usually 6 to 10 meters long. The designs were simple because they are so narrow. Here are a couple of examples, showing both sides. 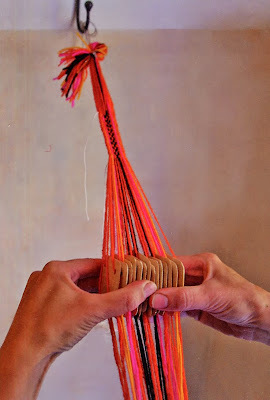 The ends were sometimes finished off with finger braiding; one end was often made into a loop that the other end could be secured in. Garters were made the same way. In the 18th century, the costume consisted of a sleeveless chemise with a short midriff blouse on top. This costume is illustrated on the right in the image at the head of the article, and was retained into the 19th century as a wedding costume. The combination of sleeveless chemise with midriff blouse is common in quite a few costumes from Finland to Slovakia. 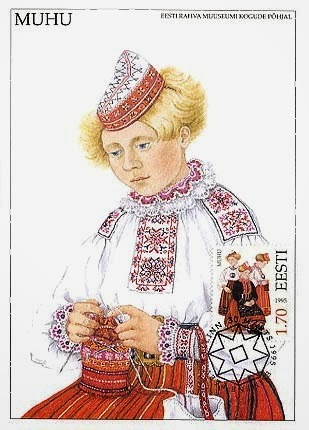 The short overblouse in the Muhu costume had a wide reticella lace border, usually featuring the eight pointed star design. 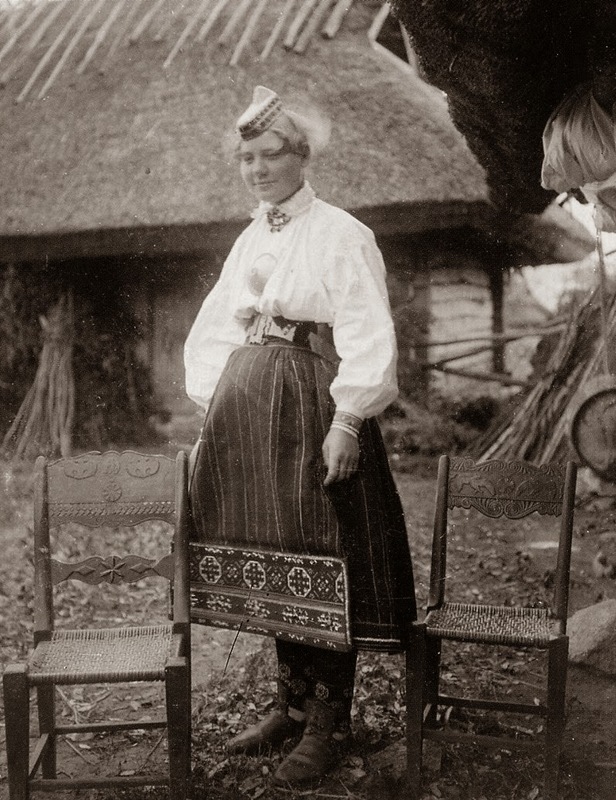 This outfit is worn with a pleated black skirt, similar to those worn in some other locations on the other islands of Estonia. The lower part of the skirt has woven in red bands, sometimes with an embroidered band near the edge. 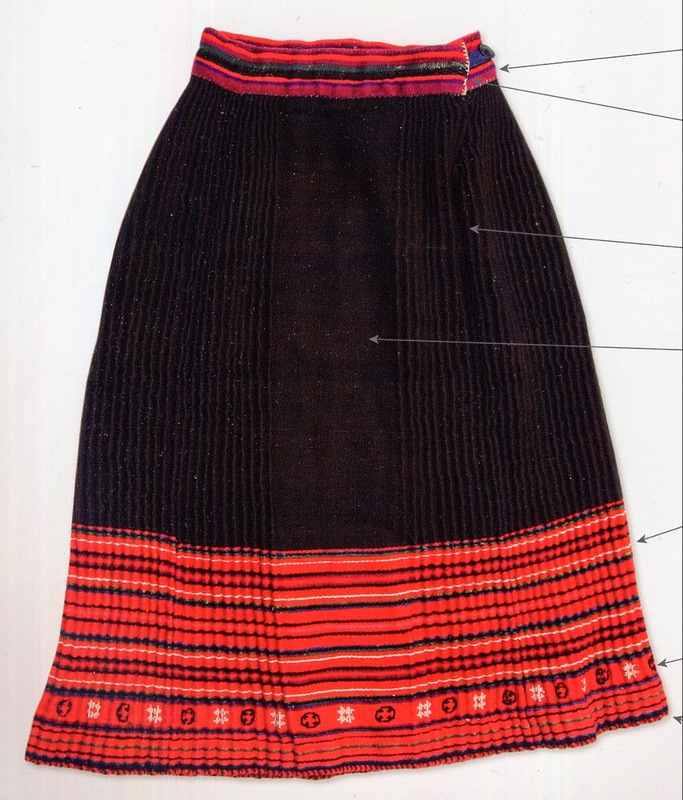 Other skirts have bead embroidery near the hem, as in the image at the head of the article. The tradition on Muhu is for women to wear their hair short. 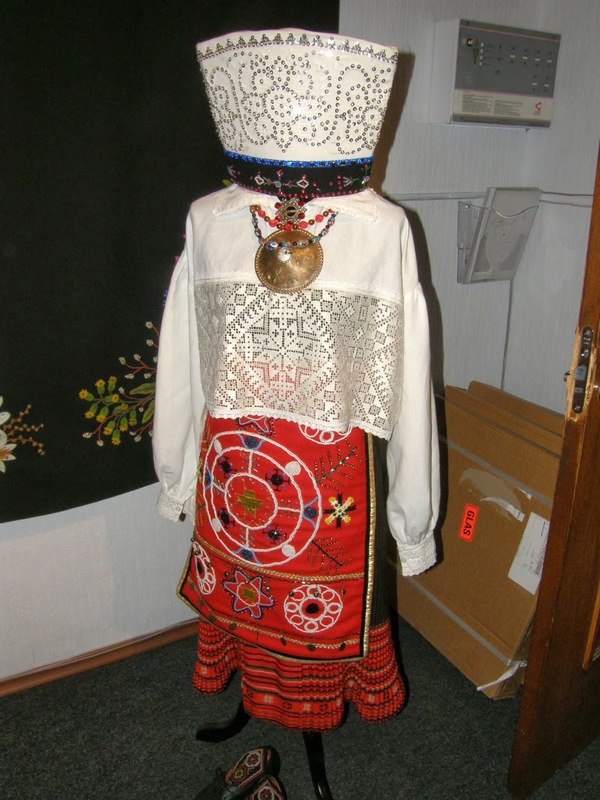 This costume is usually seen with the white wedding crown and red beaded wedding apron. The wedding apron also has buttons, coins, bells, etc sewn onto it to move and make noise. The same extremely long narrow sash was wound around the top of the skirt and apron. This outfit is worn with short white socks that have a design knitted into the top, which are worn over red striped knitted leggings and with moccasins. Glass beads, and two circular brooches of typical Balto-Scandinavian shape complete the costume. By the mid 19th cent, the costume had greatly changed. 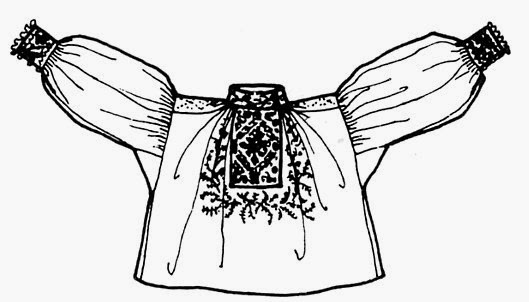 In the 19th cent costume the short midriff blouse with a sleeveless chemise undernearth had changed to a blouse which, while still short, was longer than waist length and worn tucked under the skirt. There were still narrow strips on the shoulders. The shape of the collar varied, being stand-up, fold-over, crotched, or sometimes a combination thereof. 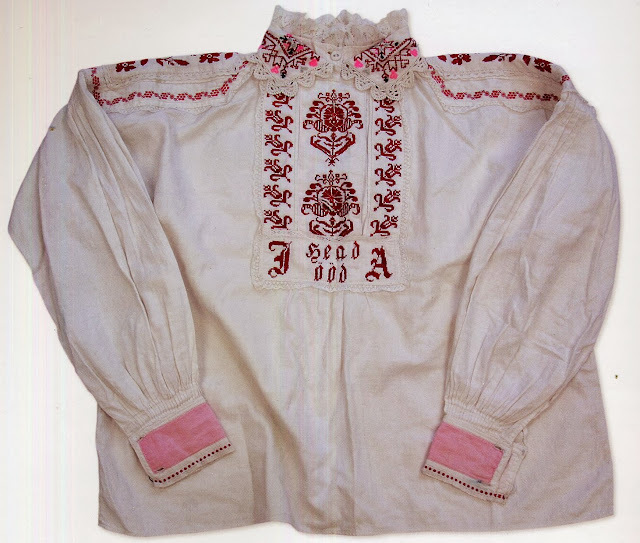 A linen or cotton petticoat was worn with this blouse. 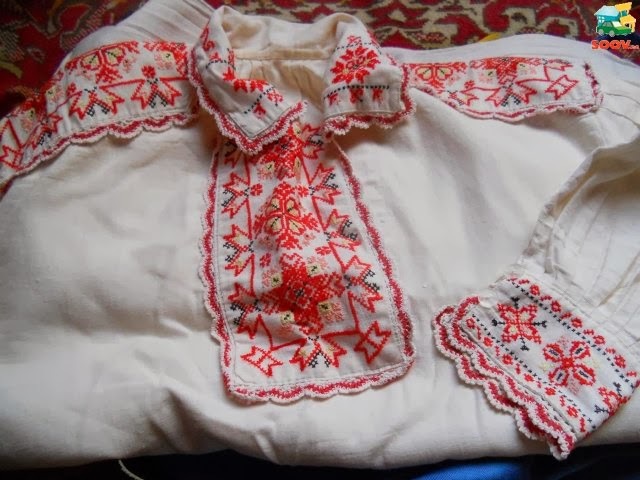 The petticoat and blouse were both edged with crochet lace, and the blouse was also embroidered, early on with counted satin stitch, and later with cross-stitch. The embroidery was centered on the collar, cuffs, shoulder insets and front placket. 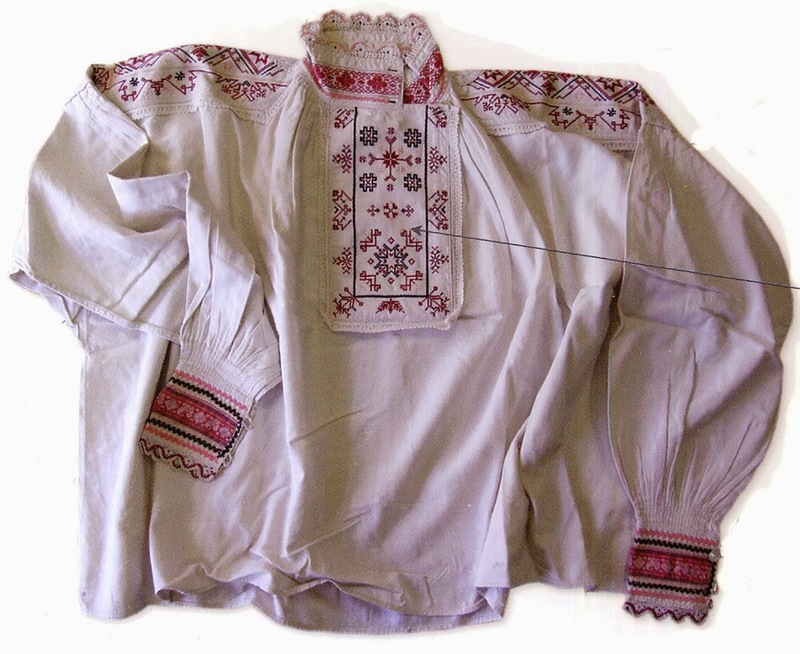 According to the traditions of Muhumaa, no two blouses, indeed no two major clothing items of any kind were ever exactly alike. Creativity is valued. 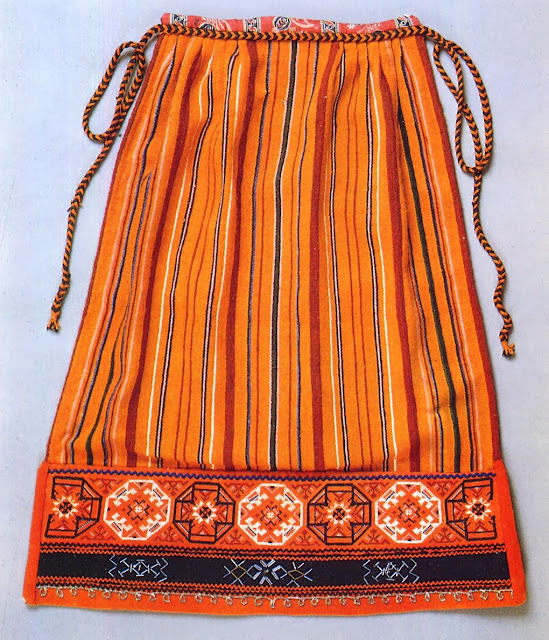 The new skirt was a striking orange color with pick-up stripes woven in by hand. Typically the warp is linen and the weft is wool. 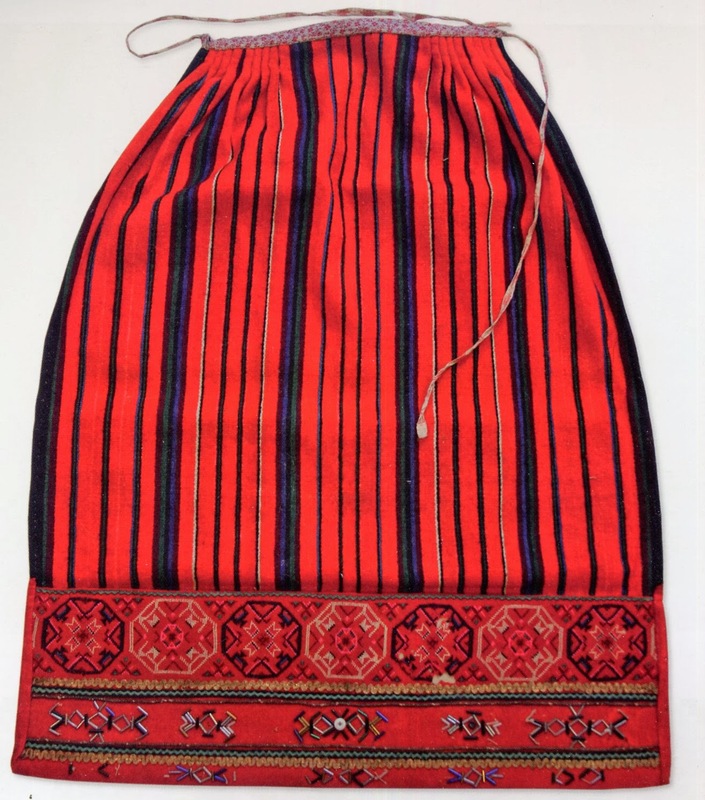 The skirts were sewn so that the selvedges formed the hem and were gathered at the waist; thus the transverse woven-in stripes hang vertically on the skirt. Oddly enough, there is no word for 'orange' in Estonian. 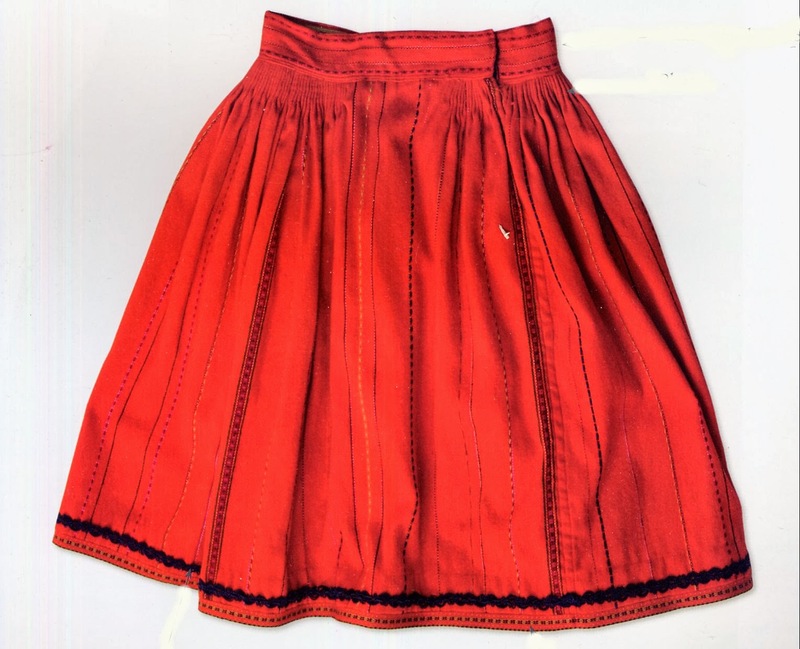 These skirts were referred to as being 'town red'. The dye used is unknown, but oral tradition says that some women used to row over to Sweden in order to obtain it. Modern experts speculate that it was brazilwood. As you can see in this example, a card-woven band, the same as is used for the sash is sewn onto the hem and often a row of trim or ribbon or crochet is sewn to the outside just above the card woven band.. A hand-width linen facing is sewn to the inside, and a wool braid is attached to the very edge. The skirt is made to be three times the hip measurement. The stripes were woven according to a particular canon, but each skirt is different. This combination of a general rule with differences in particulars is typical of folk art. Two alternating symmetrical stripe patterns are used, each of which occurs three times. A more elaborate stripe is used between each repeat. 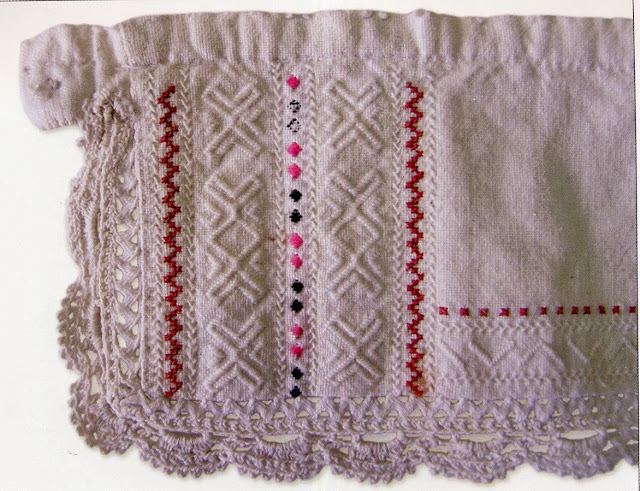 The center of one of the two patterns always forms the front center of the skirt. 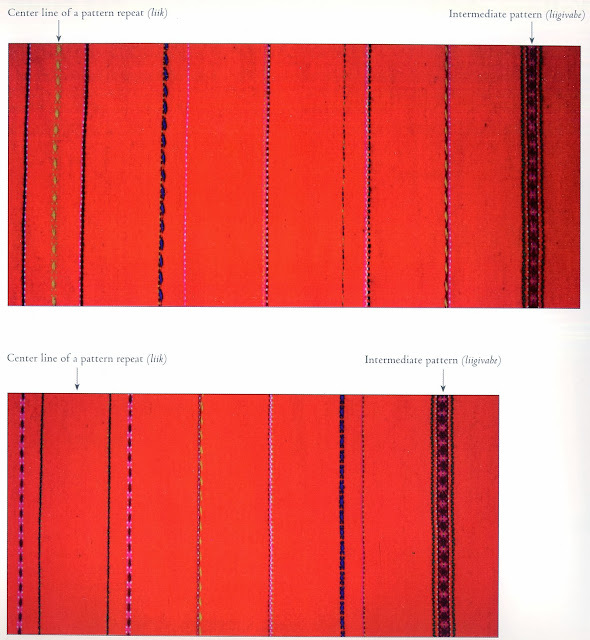 Here are the two patterns woven into the skirt above. Later, both the edging and the woven stripes became more elaborate. 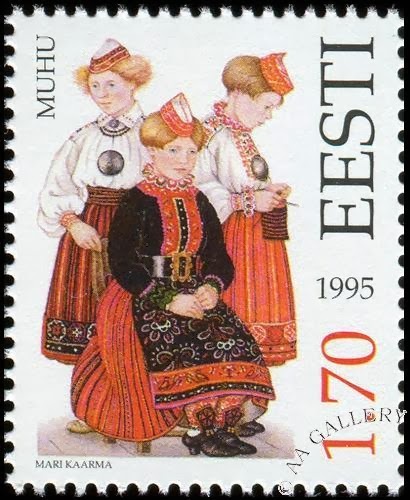 On Muhu, aprons were first worn at Confirmation. The apron worn with this costume is made of a similar orange stripe material as the skirt. 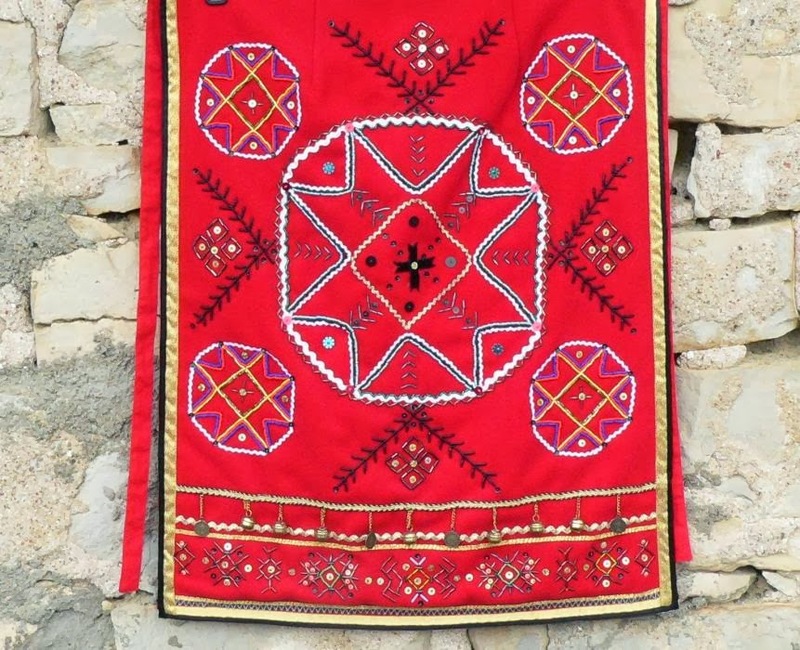 It has a panel of embroidery, usually cross-stitch at the bottom, and most times a second row of beadwork. 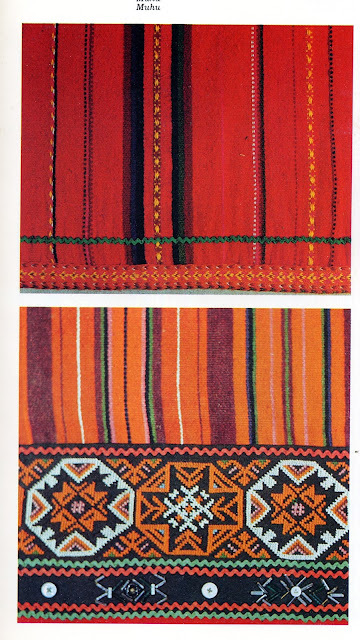 Later the home woven striped wool cloth was sometimes replaced by commercially made cloth, either of a solid color or a print. 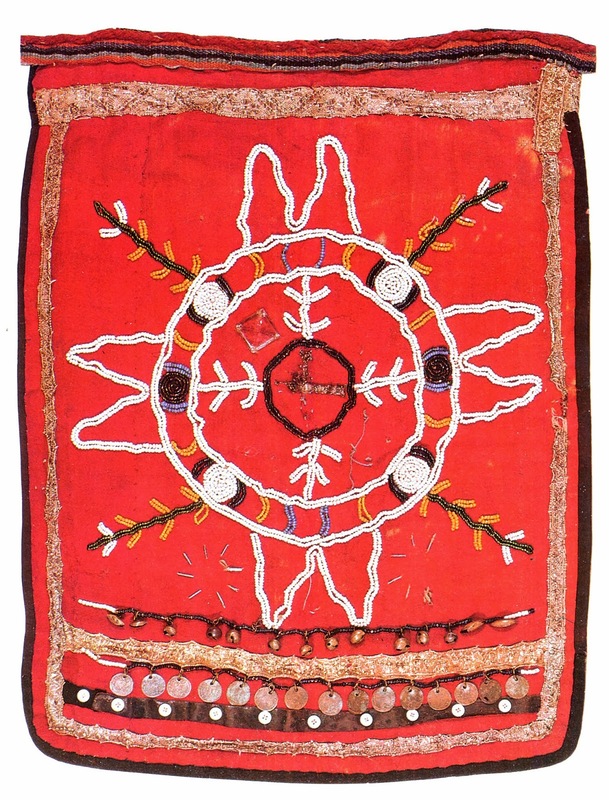 For a time, the embroidered part was stiffened so that the embroidery would be more visible. This was called 'being under full sail'. White linen aprons were also worn, some plain, and some with embroidery, usually with crotcheted edges, especially for everyday or less dressy occasions. 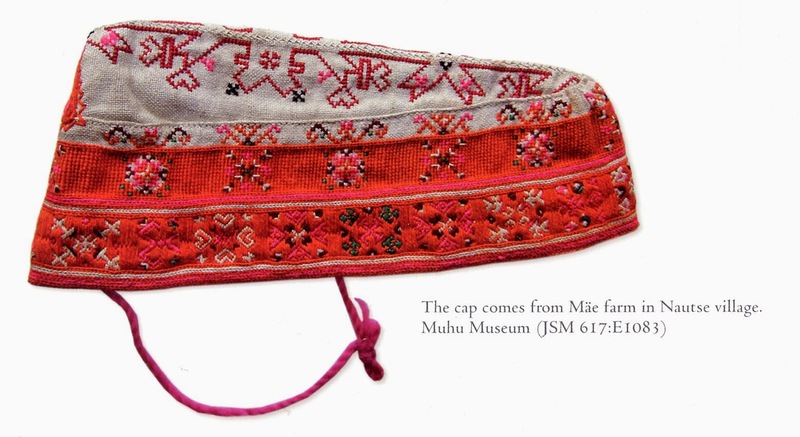 Married women wear a small embroidered cap, held on with laces which go under the hair and behind the head. In the 19th cent. 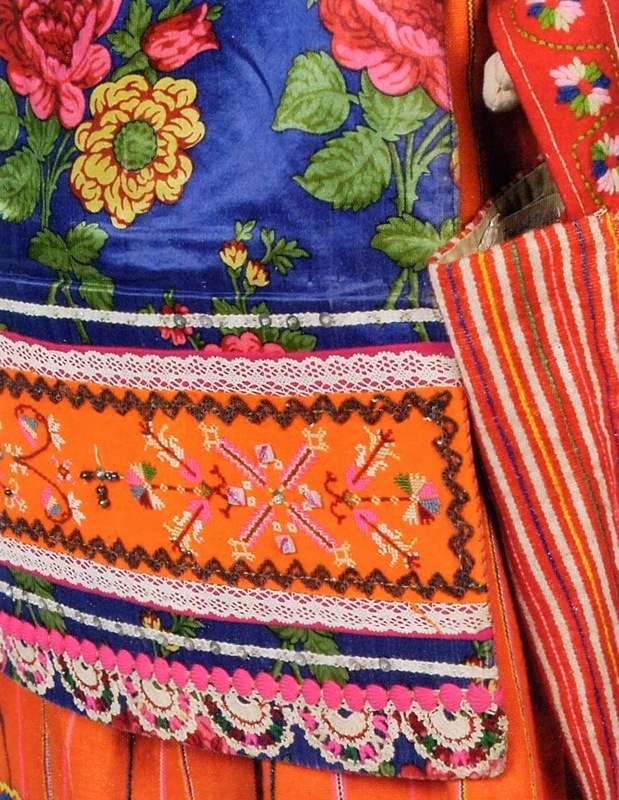 these had beautiful embroidered geometric patterns. The cap was constucted with a brim and a top, with a hole at the back. Later a triangular piece was inserted into the hole to make a peak in back. The embriodery shifted more to cross stitch. 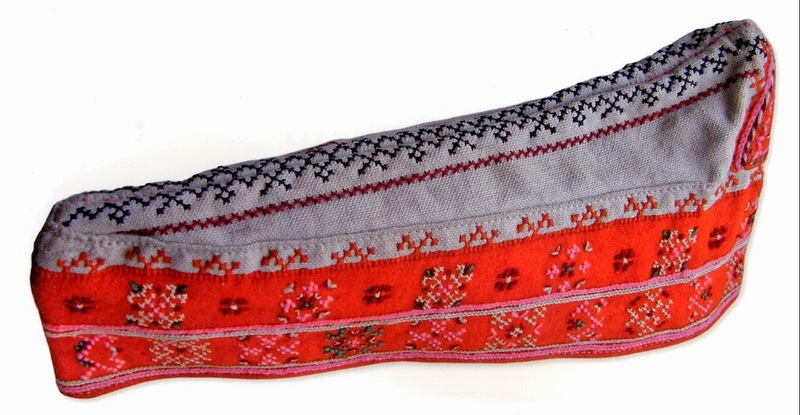 Later still, the brimwas made of orange wool cloth with cross-stitch embroidery 'written' on it. 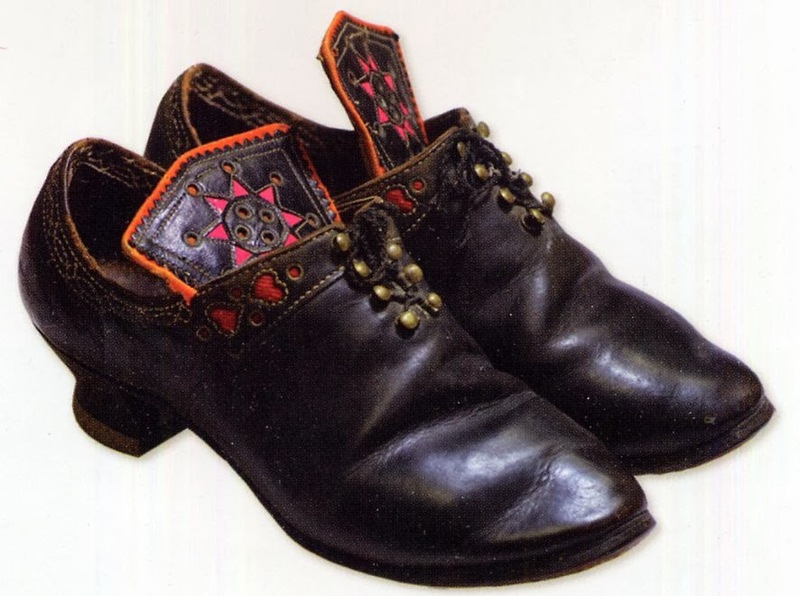 Later in the 19th cent., distinctive shoes were developed to be worn with this costume by some who could afford it. 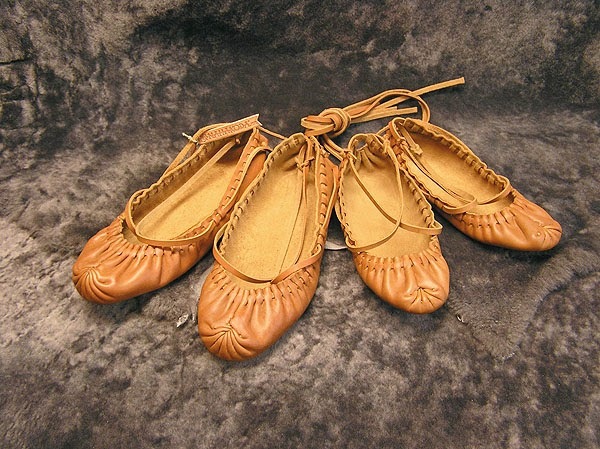 Moccasins continued to be worn by others. 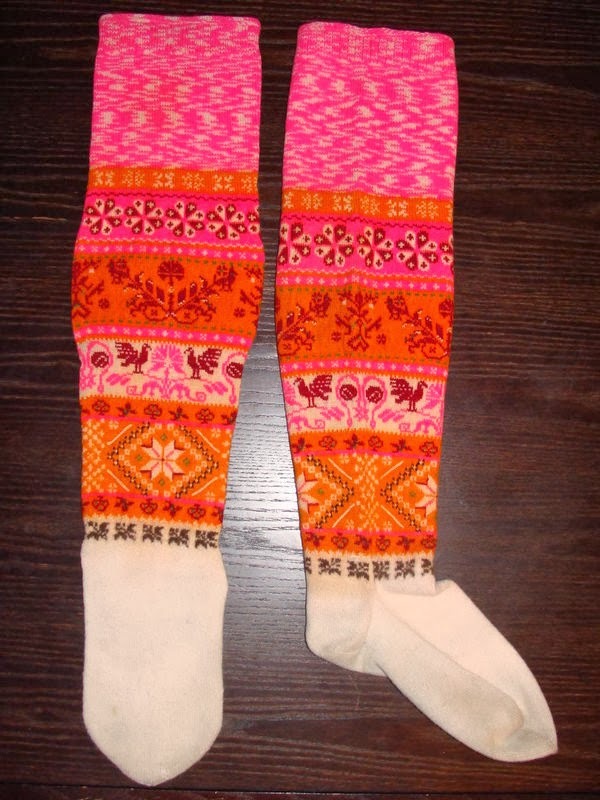 Also at this time, some began to replace the short socks and leggings with long patterned stockings. 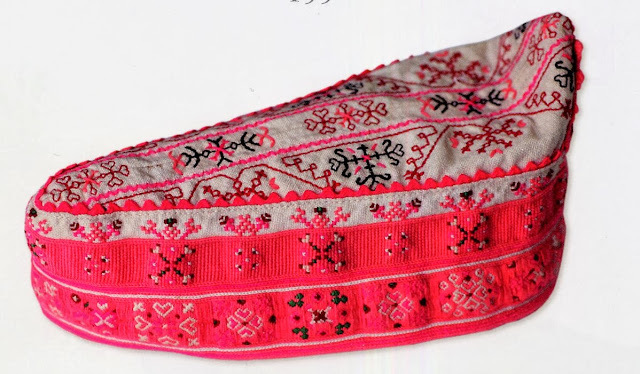 Mostly the designs were knitted in, but some details could be embroidered afterwards. The tops are secured with garters that are short sections of the narrow card woven sashes. 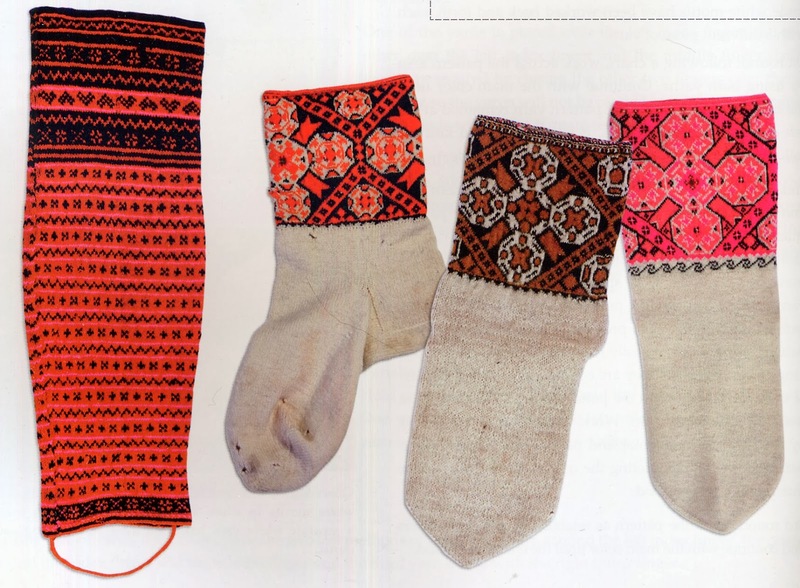 The primary colors of these stockings are the beloved orange and pink. Along with this, some people replaced the long woven sash with a wide black belt, first of leather, and later sometimes of elastic, which is worn with a large brass buckle. This costume continued as a living tradition into the 20th cent. and continued to develop. I will write another article to cover that, as this one is already long enoug. Thank you for reading, i hope that you have found this to be interesting, informative and perhaps inspiring. This article is very illuminating and interesting even for estonians! Thank you for your research!